The Monument is a 500 year old…well, monument, to the great fire of London; it’s just over 60 metres high and includes a small viewing platform at the very top. The Monument features as one of my 10 things to do in London this summer and it’s great to tick it off the list. The views of The City are quite spectacular and for a £4 entry fee you can’t go wrong, but the view is obscured by the unsightly (but probably necessary) netting, however you will have to traverse a difficult 311 steps and the viewing platform is a tight squeeze. Be prepared for a steep climb, but when you get to the top it's worth it! I’ve wanted to scale The Monument for over a year now shortly after realised that you could even go up there! It’s a stunning structure designed by Christopher Wren as a monument to the great fire of London. The tower is topped by a striking gold flame to represent the fire. Finding the entrance is really easy, just walk around the structure till you find the only door. There is a tiny little booth where a member of staff will take your payment and then you can make your way up! The price is very reasonable, £4 for adults, £2.70 for concessions and £2 for children (under 16s). You will then be greeted with the 311 step curved stairway that you will need to climb to reach the views. Located just outside Monument station, you can’t miss The Monument as it towers over its neighbouring buildings. This was most likely one of the tallest structures in London when it was built by Christopher Wren in the 1600’s, but now of course it is completely dominated by the skyscrapers of The City. Thankfully the more modern tall buildings don’t obstruct from the fantastic view from the top of The Monument. The views from the top are quite stunning; you get an excellent view of the cities skyscrapers, as well as the Shard and St Paul’s. The view, however, doesn’t compare to what you can experience at the top of The Shard. Space is also at a premium at the top of Monument, there is just about room for 2 people to pass each other. The whole viewing platform is also exposed to the elements, a fact that I quickly realised when it began to rain 5 minutes into my journey. Fortunately this didn’t last too long, but I would check the foreecast before planning your trip. Whilst the monument doesn’t offer the best views in town and isn’t the most comfortable place, it’s a great value attraction at only £4 and does provide a unique way to see London. 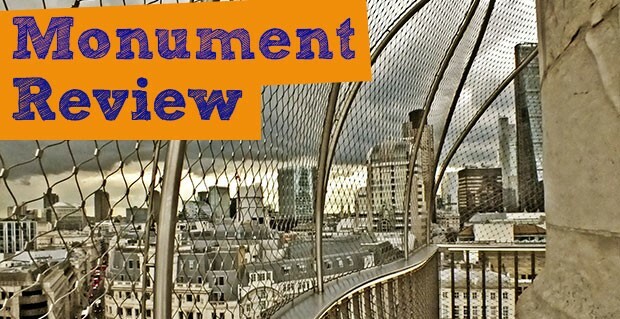 For anyone wanting a slightly higher view, check out my review of The View from The Shard. London's Pinnacle Skyscraper gets a hideous redesign.